Thousands of devotees thronged temples in Hojai as Janmashtami, the birth anniversary of Lord Shree Krishna, was celebrated with religious fervour and gaietyon Monday. Devotees in large numbers thronged Lord Krishna temples across Hojai including Laxminarayan Temple, Shiv Bari Krishna Temple, Sri Sri Radha Bollb Jeu in Bishnupally and at Durga mandir from early morning. Special arrangements were in place for the morning puja. Many devotees observed fast and sought the blessings of Lord Krishna. On the other hand, At Geeta Asharam under the aegis of Vishwa Hindu Parishad Shree Shree Krishna Janamashtami Utsav was organized with day long religious activities. 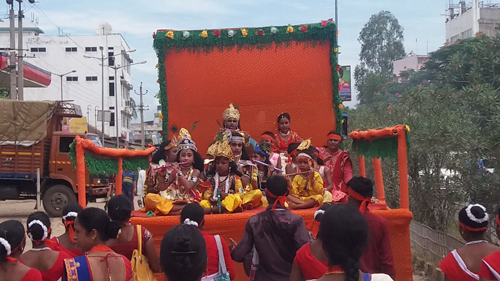 Also, traditional procession along with a Krishna Radha tableau with musical hymns was taken out in the town from laxminarayan temple to geeta asharam campus where large number of devotees participated.